The odds were not in my favor. I’d not trained as well as I should have and whatever is spawning in East Tennessee right now invaded my sinuses with a massive army. The pressure in my ears is unreal. Chuck’s work travel schedule interrupted my travel plans to Middle Tennessee and that meant childcare had to be rearranged. And then there was tons upon tons of rain. After sorting out a list of details and we were finally the road to Murfreesboro, Lesli and I encountered a large dog in the road who wasn’t fazed by interstate traffic. Even though I swerved to miss him and all the traffic swerved to miss me, I wondered if the Universe was trying to tell us something. The forecast for race day was wet with the potential for thunder and lightning. They won’t cancel the race for rain, but they would for storms. How annoying would that be after all we’d already endured! We made it in time to pick up our bibs and enjoy dinner with friends. Take that, Universe! 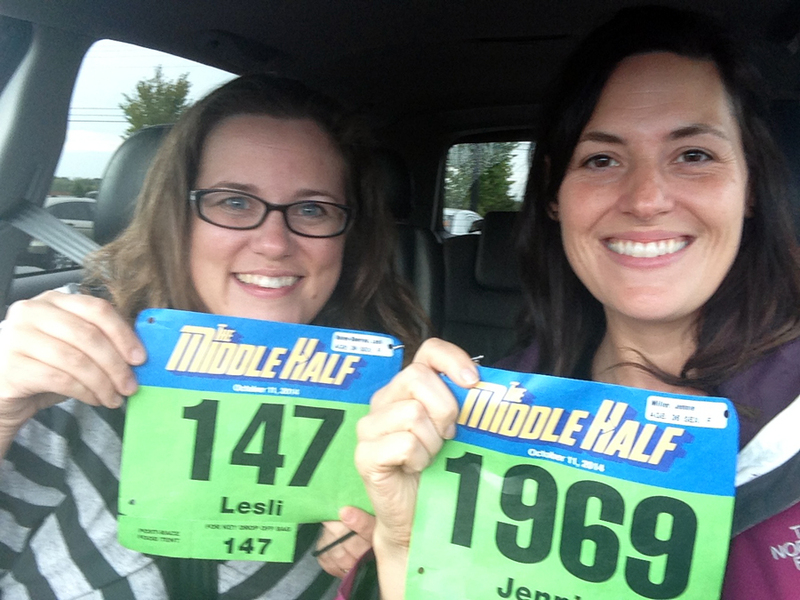 By dinnertime the nervous knots had set in and I started to switch from Road Trip Jennie to Race Day Jennie. I was fidgety, pensive, and hyper-checking The Weather Channel app. Storms, rain, storms, rain. I barely slept, despite the extremely comfortable bed we had at Lesli’s friends’ house. I dozed, checked the clock, checked The Weather Channel app, and tried to fall back asleep. Wash, rinse, repeat. The alarm went off at 5 a.m. and I was dressed and ready by 5:05. It was time, and in some crazy, supernatural way, the storms were south of us and there was a clear patch directly over Murfreesboro. The stars had aligned. We got a fantastic parking spot on campus and had plenty of time to sit still and mentally prepare before crossing the start line. Being in Murfreesboro is nostalgic for us since that is where we went to college and where the trio of Girls Weekend (Lesli, Susan, and me) was born. Being on campus together was the greatest treat. And then suddenly it was 7 a.m.
Mile 1: Easy peasy. I love running half marathons! Mile 2: Fantastic. Super fun! We’re all having a blast! Mile 3: The endorphins started to wear off and I realized I had ten more miles to go. It was time to situate my brain into running mode and ignore the misty rain that sat heavy in the air. Instead of reveling in the camaraderie of fellow runners, I start people watching. Mile 4: There’s a man running barefoot. There are two racers in the wheelchair division. There’s an octogenarian running in honor of his grandson who died in Afghanistan in 2011. There’s a group of middle-aged cancer survivors in matching t-shirts. There’s a young girl who looks no older than fourteen. Mile 5: I’m thirsty. I choose Gatorade over water, which is always a mistake. Mile 6: I have to stop and pee. Dang. I hate to stop. I also hate porta-potties. Also, the mist has turned into a very light rain. Mile 8: This race feels forever. Why do I do this crap anyway? I need new shoes. I see the man running barefoot again. Mile 9: Please, Lord, I’m done. Mile 10: Yay! Double digits! I love running half marathons! Mile 11: I stop people watching and write a scene of the novel in my head. I forget about running until I reach the next mile marker. Mile 12: I pass a woman on the side of the road who jolts me out of novel writing. She is thin and weak but under an umbrella she holds a poster sign for all of us that reads, “Run for me!” I don’t know why she can’t run, but I decide to run for her anyway. I tear up. It’s almost over. Should I speed up? Mile 13: Yes, I should speed up and finish strong. Always. Finish line at 13.1 miles: I cry and delight in all the strangers clapping for me. We love each other deeply for those few seconds. My time was average at two hours and eighteen minutes. It’s not my best (which was Knoxville in 2012) and definitely not my worst (Ugh! Oklahoma City in 2009), but I’m satisfied considering the constant light mist and rain, my allergies, my mediocre training, and everything else that made me feel like I couldn’t do it. But I did do it, and so can you. I continue to be encouraged by the caliber of person who runs these races. Some are professional athletes who travel the country running races for the purse money and endorsements, but we’re talking about maybe 15 people out of thousands. The rest of us are everything you could imagine – old and young, man and woman, every ethnicity, size, shape, and fitness level, from professionals and creatives to students and military, from people who run their fastest to qualify for Boston to those who run at intervals or walk the race in its entirety. We’re all there, not running the same race, but running our own races on the same road. The camaraderie is unmatched. There is endless encouragement and support, gratitude and pride. For the span of the race, we are a family of cheerleaders. Not everyone runs his or her best race every time, but there is one essential thing: we all started. We all took that first step towards reaching a goal. The majority finishes, but at least we all started, and that’s something many people don’t do. Great summary of the fun we shared at the Middle Half. Thanks! You ran too? Aren’t you so glad the rain held off?? I love this. I am not a runner but I’ve always wanted to be one. 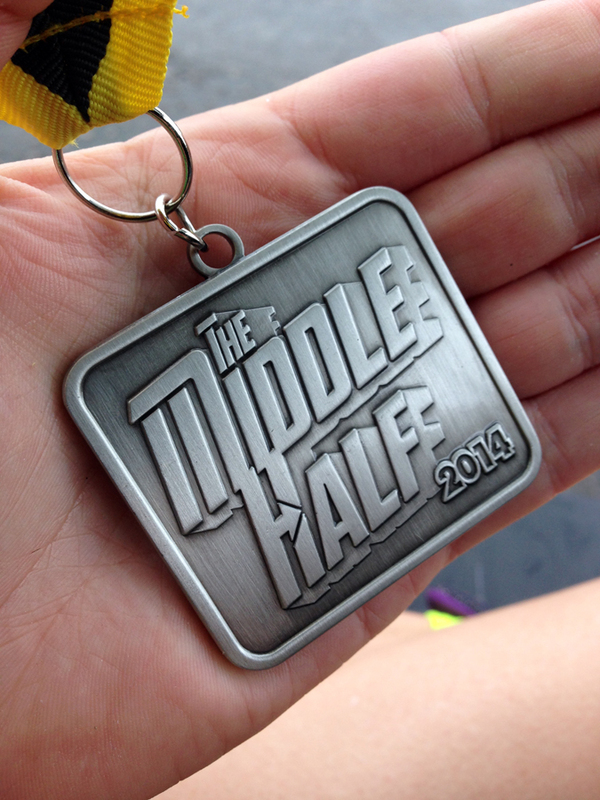 My goal for this next year is to run the Middle Half. Reading this is very encouraing and I appreciate you for writing it! Do it, girl! Everyone starts the process by wondering if it’s even possible. I’m here to tell you that YES it is possible. You have to own it, though. Work your tail for it. Train and treat your body well. When they put that medal around your neck at the end, you’ll be forever changed. Nice post! I ran this too but at the back of the pack. So glad the rain wasn’t as bad as expected. Great job! I was so thankful the rain held off! And it doesn’t matter where you are in the pack, my friend. You did it and that’s what matters! Amen! I too completed the Middle Half … For Chloe … But you would likely have never seen me. I was dead last. But I finished. And the cheering doesn’t stop — even after FOUR HOURS. So I won *MY* race … Just for Chloe. Oh my goodness! So glad you left a comment, Laura. I saw all of the Chloe shirts and my heart swelled. I love when people get together and run in someone’s honor. Way to go! Cherish that medal, girl. You earned it. Way to go! I finished at 3:51 or something like that. Had the worst foot cramp ever! Love the cheers along the way even after most people had already finished. I love seeing people run for others! You’re an inspiration! I finished in 2:20 and saw all those same folks you mentioned, so you might remember seeing me, a 52 year old woman running in a green shirt and white hat. 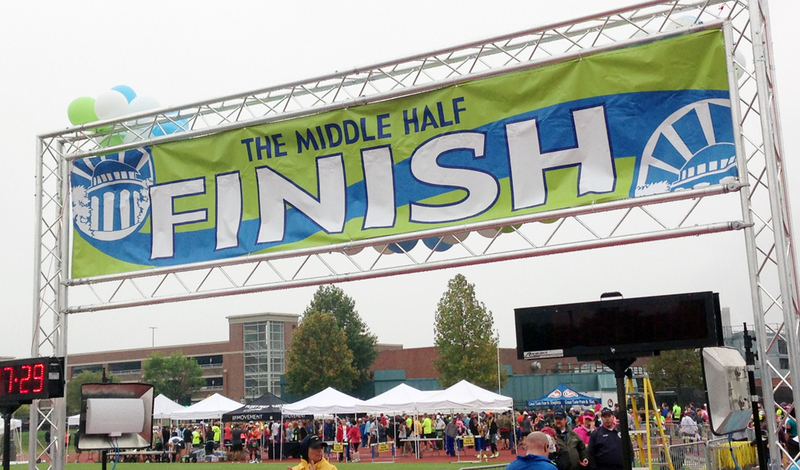 It was my very first race and I am so thankful the rain was just perfect for running. I was struck by the barefoot man, wondering how he could manage that run without good shoes. My favorite part of the race was the kiss from my sweet hubby who waited at the finish and adorned my neck with my first half marathon medal! Usually when I do a half, somewhere around mile eight or nine, I think “I am never doing this again!” This year that didn’t happen until mile 11 and by that point I could almost see the MTSU track stadium looming on the horizon to keep me going and I pushed through it. Not my best race ever. But after having to take a year off due to injury, I was pleased to get back to the point that I could finish. I think we all have that moment during the race (or even during long runs for training) when we wonder why we’ve chosen such a tough task. It’s always mile 7, 8, or 9 that gets me, when I’ve been going for more than an hour and there’s still another hour to go (give or take). Getting to mile 10 is a BIG deal. I’ve seen a bumper sticker that says “I run half marathons because I’m only half crazy” That sums it up for me. I think a half marathon is my limit. I have no desire to train for and run a full. Now, if I could swim the equivalent of a full marathon, I’d be all over it. Love swimming.